Working with Drupal Themes Pt. 5 – the finale! Rendezvous with Delta Squad we must. Upon them, we rest much hope. 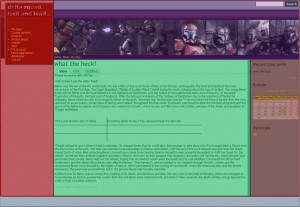 Well much progress in my Drupal theme has been made. 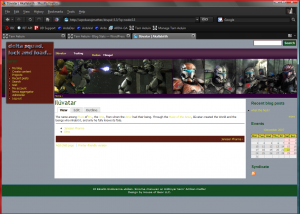 I scrapped what I had before (see Working with Drupal Themes Pt. 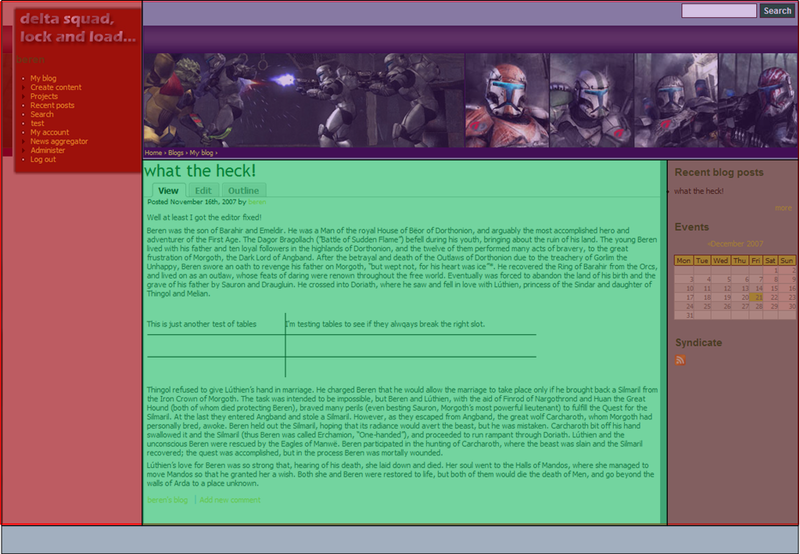 4) and completely redesigned how the main template is structured. I’m not sure how to show this, but here’s a shot of the layout. I color coded the major areas of the interface. I still maintained a basic table structure and then within the major table regions I used CSS positioning and styles to get everything right. The image to shows how I broke up the table. The different colors show how the main table is constructed. Each color is a table column or row. It is much easier to align the header files with the trooper images. This is a different layout than I used with Plone, but I think this is better. The difference is that I made the left sidebar a full column. With the first version I had a main table row the header going all the way across the page. I didn’t like that and I had some trouble with positioning. I like this much better and will probably go back and make my Plone skin work the same. When you wish to create some theme, sometimes could be better to start with existing one, and to make modification. I totally agree. My troopers theme is based on zen as are all of my theme articles for Drupal. Zen is the best theme to start from since it has all the basics and enough comments to help you see what’s going on. For me this was good and bad since my theme is structurally quite different from zen. I do intend to return again to my theme and look at a pure CSS theme with no tables, but right now I was having huge problems with cross-browser compatibility so I gave up. Before I revisit my troopers theme, I’m going to look at creating a “Saab Turbo-X” theme…I just got a decent shot of the turbo unit so I’m all set to start this. Next story Plone and Drupal – Which is Better?